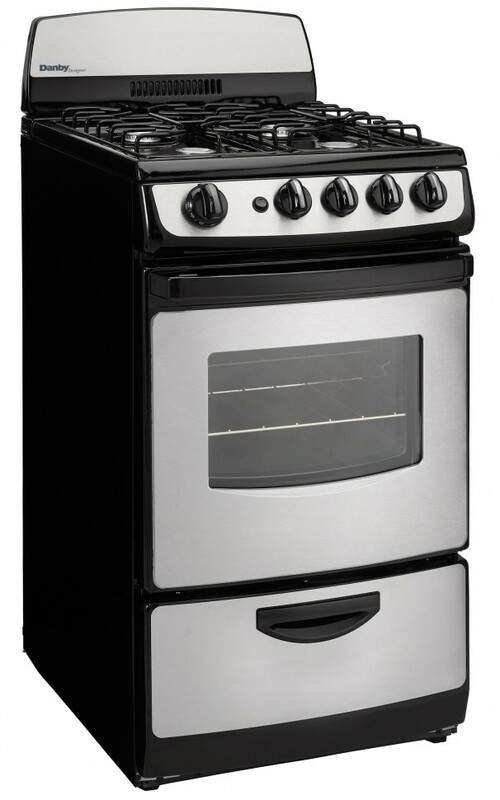 Cooking up your favorite dishes is always a breeze with this compact gas range by Danby Designer. This slim and elegant model is just 20 inches wide (50.8 cm) which makes it ideal for remote locations and smaller kitchen spaces. It’s compatible with both natural gas and liquid propane and is controlled by a clever electronic ignition unit along with push-and-burn safety knobs. There is a pair of sturdy and durable racks in the 2.4 cubic-foot capacity oven along with a bright interior light, fashionable window and broiler drawer. The range provides four 9,100-BTU open burners and one 13,000 BTU oven burner as well as an integrated lip to contain any spills. This unit doesn’t take much to clean due to its black and stainless steel, scratch-resistant porcelain surface and large backsplash. In addition, the gas range boasts an 18-month warranty on parts and labor along with convenient in-home service.